Welcome everyone! 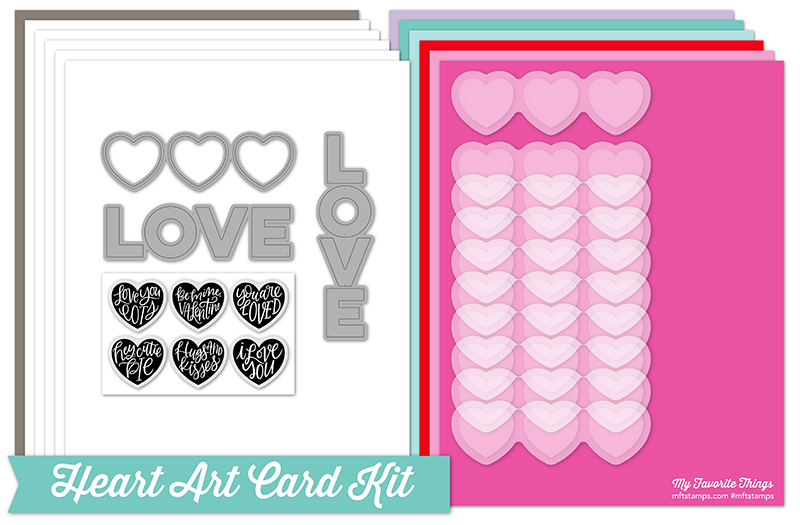 Today is release day for the MFT Heart Art Card Kit. I’m excited to share with you some inspiration using some of the elements from the kit. Here’s a quick look at the entire contents of the kit. The first card I’m going to share is using the shaker pouches in the kit. These make making shaker cards a breeze! Using a piece of white card stock trimmed down to 4″ x 5 1/4″, I’m going to die cut out the Heart Trio. This creates the opening for the pouches. Next, run double sided adhesive around the outer edge of the shaker pouch going all the way around. You want to put the tape on the side that will be going on the back of the card panel. It’s much easier to see in the VIDEO. Then remove the backing of the tape and pop this into your windows. Before adding my shaker bits, I added double sided adhesive to the entire back of the card panel. Then added my sequins to the shaker pouches. I removed the backing of the adhesive and added a piece of pattern paper from the Sweet Stack Paper pack. The pattern paper measures the same size as the front panel. My shaker panel is added to an A2 card base that I created from Dusty Rose card stock. 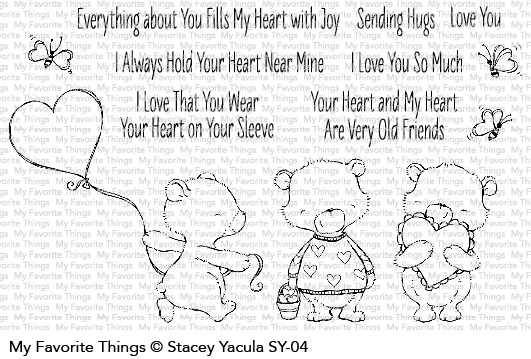 I finished off the card by adding a sentiment from the Joyful Bears stamp set. 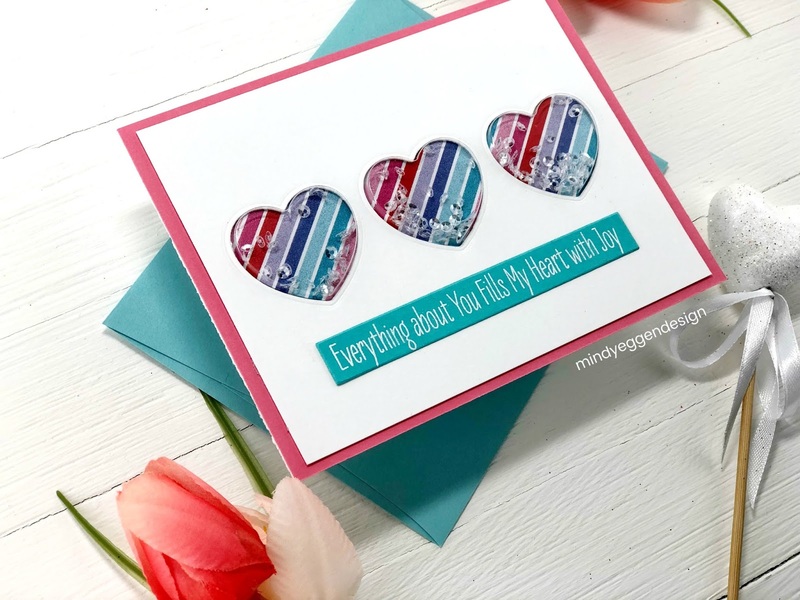 I heat embossed with Gina K Designs white embossing powder onto Sea Glass card stock and trimmed down with the Sentiment Labels die from Simon Says Stamp. So easy to create! For my next card, I’m going to do a little ink blending. I start with a 4″ x 5 1/4″ piece of Bristol Smooth card stock. Then ink blend Festive Berries and Worn Lipstick. I work from the outer edge towards the middle, keeping the lightest part of the card as light as possible. Next, I’ll smush down some of the Festive Berries onto a craft mat, spritz with some water and flick onto my background with a paint brush. 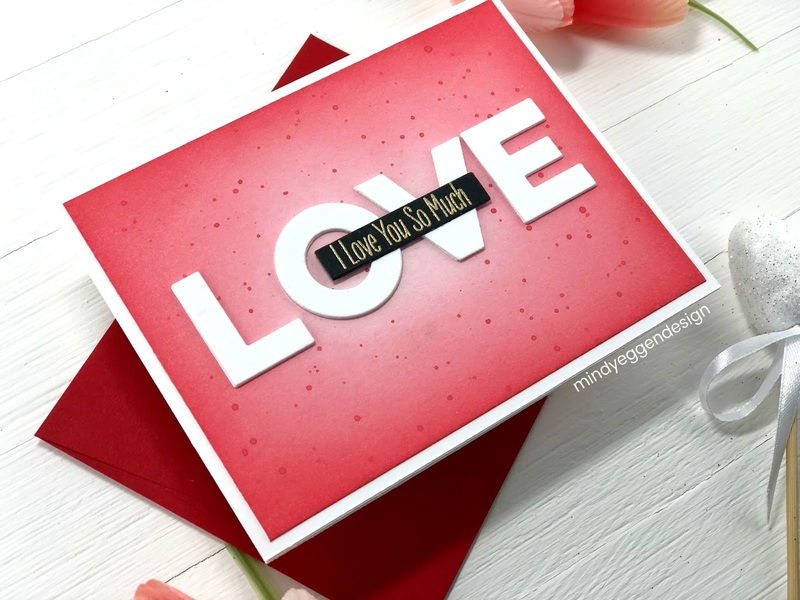 I die cut the LOVE three times from white card stock and layered using Gina K Designs Connect Glue. I added to the center of my ink blended card front and matted to an A2 size card base. To finish off this card, I heat embossed a sentiment from the Joyful Bears stamp set. I used Versamark ink on Black carsd tock with gold embossing powder. 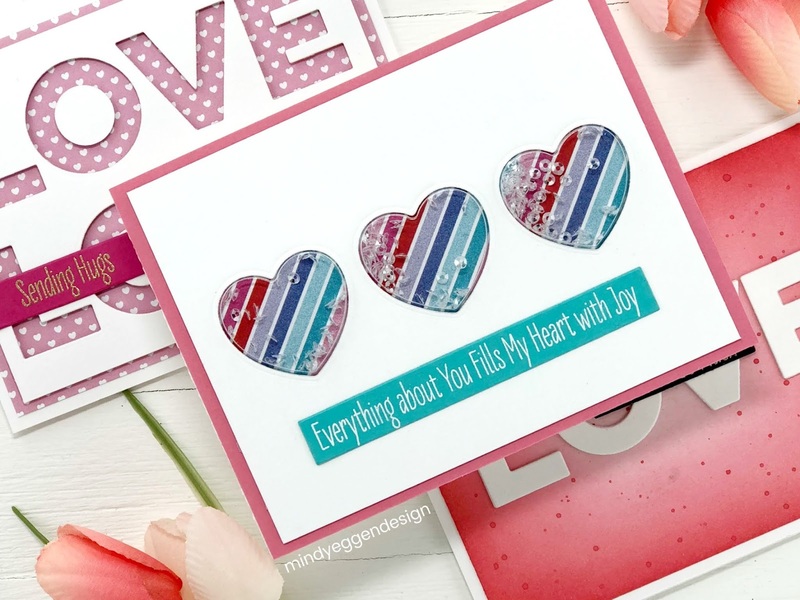 I trimmed down the sentiment using the Sentiment Labels die and added to the middle of my card. This last card was kind of a bonus. Without realizing it, when I cut out my LOVE word for the previous card, I happen to cut it perfectly lined up on the white card stock. So I trimmed down some more paper from the Sweet Pack to layer behind my card panel. I added foam tape to the backside of the panel with the words cut out and added to the pattern paper. I added my panels to an A2 size white card base. 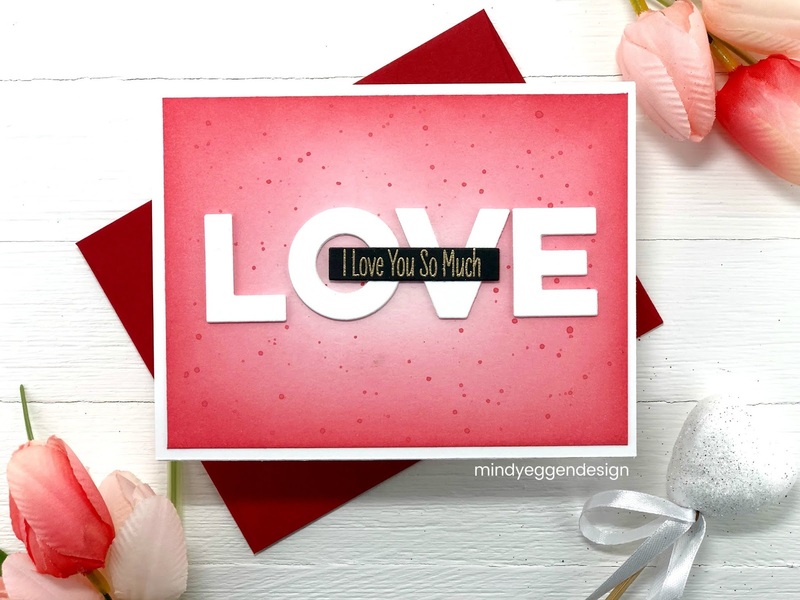 To complete the card, I stamped a sentiment from the Joyful Bears set onto Passionate Pink card stock and embossed with Gold embossing powder. 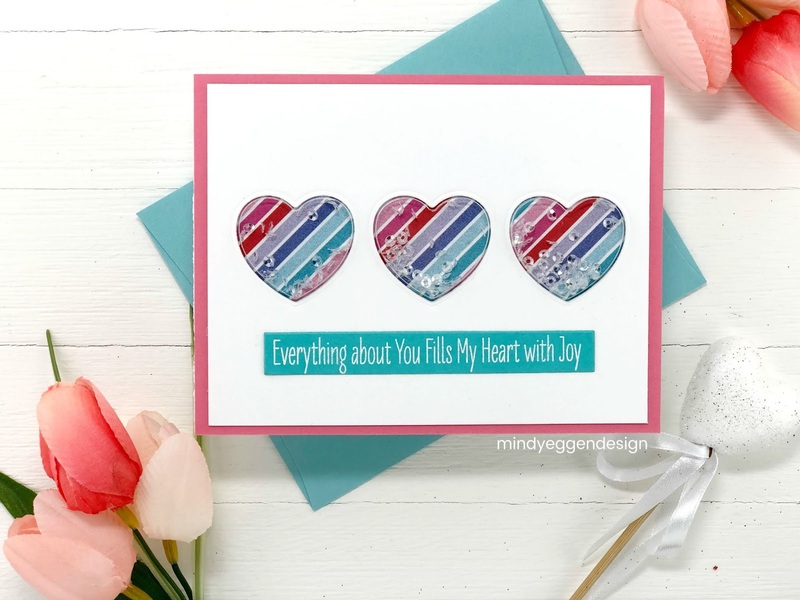 Three quick and simple cards that you can get from the Heart Art collection. Also being released today is the Joyful Hearts Bears which is such an adorable set. Be sure to check back tomorrow for inspiration using this new set but you can pick up this new set now! Affiliate links are used at no cost to you. Thank you!